United's communities offer a full range of programs and services in a socially active environment with a lifestyle that provides the independence, privacy and companionship seniors desire with peace of mind of knowing assistance is available 24-hours a day. Residents live in private accommodations and have access to daily housekeeping, meals served in a beautiful family style dining room, social and wellness activities, personal care medication management assistance, transportation to local doctor appointments and more. 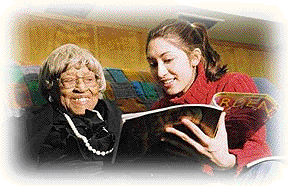 Personalized programs are designed to meet the residents needs as they may change over time. A special residential program for individuals with Alzheimer's and memory loss is located in our secured buildings that were designed with the needs of these seniors in mind. Our assisted living communities are for seniors who need the security of a little extra help with day-to-day tasks such as bathing, personal hygiene and medication assistance. Support and care is provided as indicated by professionally prepared individual care and wellness plans. Assisted Living is a wonderful option for those who may, from time to time, require a helping hand with personal care and other needs. Our studio apartments provide room for your personal furnishings and family photographs, making each apartment feel just like home. Seniors enjoy a more active and independent lifestyle without the worry of household chores. Studio apartments are available at some of United's cottages where the basic service plan includes three nutritious, home cooked meals daily, plus snacks served in the private dining room and weekly housekeeping and laundry services. United offers residents a distinctive residential community specializing in assisted living care for the cognitively impaired which is designed to enhance the quality of life and experiences for our residents. Each day begins with familiar routines and our experienced staff offers gentle encouragement, memory enhancement and assistance while supporting each person in areas of particular need. In this supportive safe environment you can feel confident that your loved one is being nurtured and cared for the way you would expect. United's cottages are the ideal setting for a short-term respite stay, whether a loved one is recuperating after a hospitalization, or needs some assistance for a short time while a caregiver/companion is away. Our respite program offers seniors a safe and enriching environment with support services, activities, delicious meals, housekeeping and more. The respite program is also beneficial for a prospective resident or family member contemplating whether our home is the right choice for them. Seniors interested in making life a bit easier will often come and stay for a few weeks or months to meet some of our residents and see how enjoyable life at one of United's cottages can be.